So today, I thought it’ll be good to clarify a statement I made in yesterday’s devo. It is easy for us to understand that when the Bible talk about us being sons of God, it’s not referring to the male gender of humans. That’s the easy part but being the bride (wife) of Christ; a lot of ‘dudes’ including myself find that difficult to comprehend or relate to. You know, God is an interesting character. He can be very spontaneous, but I’m beginning to realise that His spontaneity only seems that way from our perspective. Because there’s always a bigger purpose behind what He does. For example we don’t know how long it took after Adam was created before God decided to create Eve, but we do know there was a time period and probably longer than just a few days considering Adam had named ALL the land and air animals before Eve came. (Gen 2:19-20). And from yesterday devo we saw why God waited before creating Eve. But what I wanted us to note here is that when man (Adam) was created he had both of what we associate with being male and female attributes within himself. Man was created in the image of God therefore God have both male & female attributes, but He’s neither male or female. He’s God. Don’t quote me on this but I believe God being a father does not necessarily means He has a male figure. Who knows no one has ever seen the Father. It was Jesus who came to show us that God has a father’s heart. So just as God has both male and female attributes so was Adam. God took the female attributes from Adam and made a companion for Him. When God looks at us He doesn’t see genders (i.e. He’s not looking at our gender). 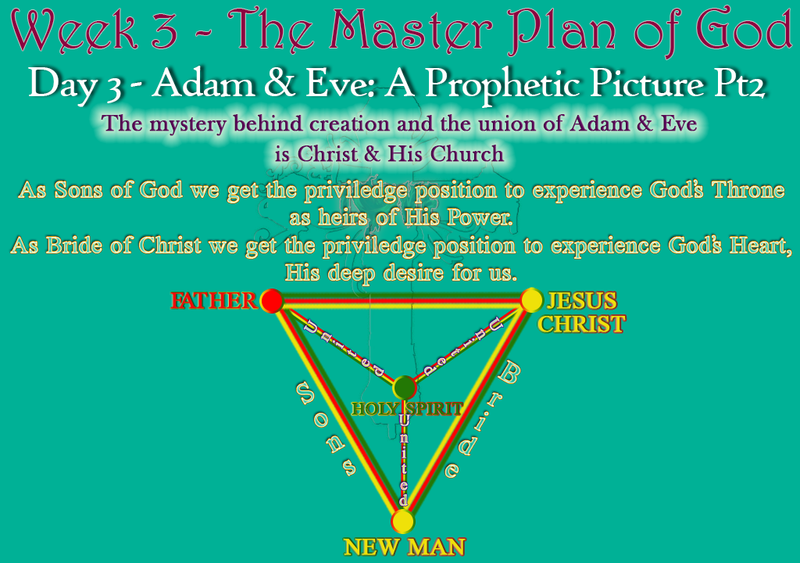 He sees Adam (i.e man) or people created in His image and the proximity (position) He’s given them to Himself. In ancient times, sons are those that inherit the father’s possessions with a double portion going to the 1st born son. Therefore when God refers to us beings sons of God, He’s referring to the position (relationally) He’s given us with Himself. He uses the human term “sons ” to help us understand the relationship we have with Him. Therefore as sons of God we get the privileged position to experience God’s throne as heirs of His power. I mean we will literally get to rule the universe with Him. WOW. This is similar to when we are referred to as being the bride of Christ. It doesn’t mean we literally get to marry Jesus Christ, which I’m sure we all know. The most intimate human relationship that exist on earth is that of a husband & a wife. Before Adam & Eve had any children, they had each other and through their loving intimate relationship came forth children. As Bride of Christ, we get the privileged position to experience God’s heart, His deep desire for us. We get to know God intimately; heart to heart: We get to experience ALL of the fullness of God through Christ. WOW. Natural human history began in Eden with Adam and Eve joined as a bridegroom and bride (Gen. 2). Natural history ends in an Eden-like city with Jesus and His people joined as a bridegroom and bride (Rev. 21-22). The New Jerusalem is called the Bride because it was prepared for the Bride and is where she experiences a face-to-face relationship with God (Rev. 22:3-5).